Some people might have problems reading the text of the icons and menus in Windows. The font size can be too small and making it bigger might help. 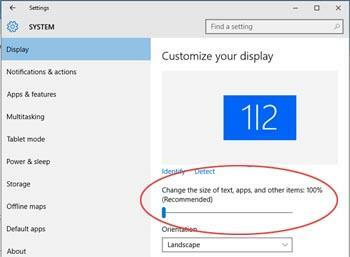 Windows gives users the possibility to make the text and other items easier to see by making them larger. This can be done by increasing the so called Dots per inch scale or DPI. To adjust it, just follow the steps outlined below. In Windows 10, first click the Windows logo in the left-bottom corner of the page and then click "Settings". Then click "System". Now there's a slider on this page that you can use to change the size of text, apps and other items. 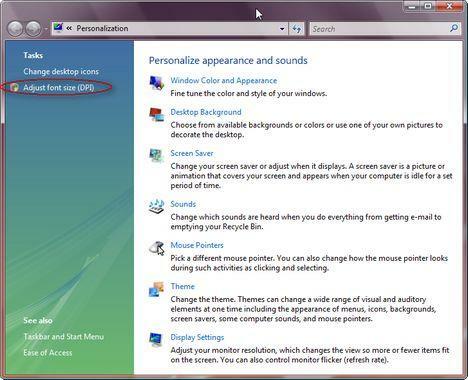 In Windows 8, First right click on your desktop and select "screen resolution". Then click "Make text and other items larger or smaller" text link at the bottom. Now you can change the size of the font. 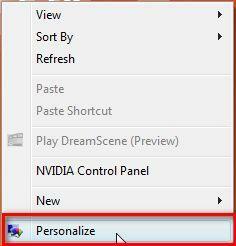 In Vista, first, right click on your desktop and click on Personalize. Alternatively, you can go to Control Panel -> Appearance and Personalization -> Personalization. In the Personalization window, go to the left pane and click on Adjust font size (DPI). If UAC is turned on you will need to make an additional confirmation so that the DPI Scaling window will launch. 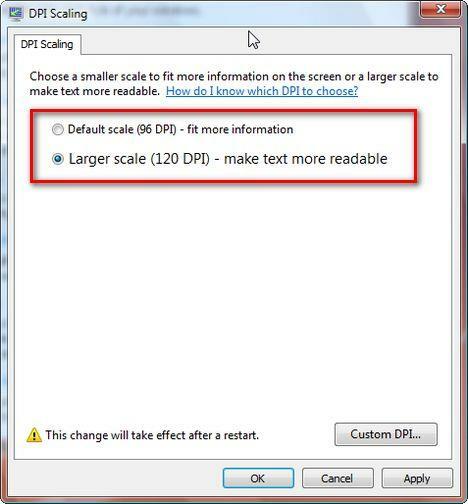 You can choose the default scale of 96 DPI or a larger one of 120 DPI, which makes the text more readable. If these two options are not enough you can click on the Custom DPI button and choose another size (DPI). 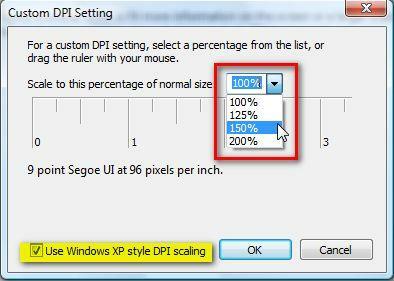 In the Custom DPI Setting window you can select the desired percentage for the DPI increase. You have the following options: 100% for the normal size of 96 DPI, 125% for 120 DPI, 150% for 144 DPI and 200% for 192 DPI. If you set the DPI higher than 96, and you are running Windows Aero, the text and other items on the screen might appear blurry in some programs that are not designed for high–DPI display in Windows Vista. You can avoid this issue by using Windows XP style DPI scaling. Just check the appropriate option and press on OK. The change can be applied only after a system restart. Close all the running applications, save your open documents and then press on Restart Now. After a reboot, the font size will be changed. Someone please tell me why, in 2008, with a 3 way battle for OS Supremacy (I grant Ubuntu that it's a strong enough Linux distro to matter) - why why why can't I set font size and/or screen resolution PER USER? Check the related articles mentioned at the end of this tutorial. You can often go smaller by using higher screen resolution, however there is a sweet spot for performance for each monitor. Under the Custom DPI window try entering something like "75%" in the box. It's a ComboBox, a text field with a set of preset options but you can also enter a value of your choice. Microsoft just figures that if you're changing the system DPI you're trying to make it more accessible to users that need such accommodations. And if that doesn't work, I'm sure it's stored as a Registry entry somewhere. Just hunt around on Google, it shouldn't take too long to find. Neither approach works. If you type a value less than 100%, Vista changes it back to 100%. If you change the value of HKCU\Control Panel\Desktop\WindowMetrics\AppliedDPI to less than 96 DPI, Vista changes it back to 96 DPI when you log on. It's incredibly stupid that I can no longer change my custom font DPI to the actual DPI of my monitor. I like to have a 10-point font actually display in 10-point size on my monitor. I could do it on XP, but it's impossible in Vista. You might be able to take Vista's permission from this reg. key. Go into regedit and navigate to the said key (make sure you select the key on the right, not the "folder" in the left pane. Right click it and go into Edit-Permissions. In the list, click System and Deny all permissions. Make your changes and reboot. Please tell me if it works or not if you try it! I discovered zoom out by pressing the Tools icon. Was happy with 125. Don't know what I'm doing to cause the size to change apparently as I move my hand across the keyboard. I keep returning to Tools icon to select 125 again and again. Many Thanks to those that contributed to the thread - but my immediate help needed is - "How do you change the font of Segeo of DPI" to something else say Courier? Easy... Tools - Options - Compose - Font Settings - you can then change the color as well as font and font size. How can I change my font size and icons into normal size? I already did the DPI thingy and i put it into 100% which is the normal size. It doesn't make any changes. How can I put into the normal size? in xp, you can change the size of title bar, the font size of icon, even font size of message box, how can you do that in vista? This was already explained in a previous comment above. scroll down or get to the "ok" or "apply" box.... ??????? pls help me on this ,how can i change font sizes when the dialog box doesn't fit on screen? its too big that it cant project the whole exact thing to do, im slowly being pissed off. I've had the exact same issue, you have to boot the system in Safe Mode, F8, reopen normally the DPI dialog box, and from there you can easily change back the font size, because the bottom line is showing! I MADE THE DPI SCALE AT 192 AND NOW I WANT TO CHANGE IT TO 144 BUT SINCE THE DPI IS SO HIGH I CAN'T GET TO THE APPLY AREA BECAUSE IT IS OFF THE SCREEN. IS THERE HELP? THANK YOU SO MUCH IF YOU ARE ABLE TO HELP. New HP laptop keeps changing resolution of monitor. My new HP laptop keeps changing it monitor resolution to a smaller size ( higher resoluition ) on my monitor. I have an older dell cathoid tube monitor and running windows XP through a HP docking station. This does this quite often and I like the larger icons ( lower resolution) due to my age and eyes sight. I am not running Vista but XP pro service pack 3. My NOC team says that is a common problem but does not know how to fix it. I change it through the control panel / display setting resolution but it keeps / flipping or switching back. Any ideas. How do I change the font from 10 to 12 in hotmail? Thanks. Every time I log on to my shut down my Toshiba Windows 7 Laptop , the textsize changes to medium, and I change it back to small, it makes me log off and then everything is fine until I shut it down, then the next time I get on my computer, back to medium. Why does the text size keep resetting? the contents in my dialog box appear blur while the title bar is normal. windows 10. please help!! some how the font size got changed to a larger size and I want to change to the default setting. I have tired every way that I can think but to no avail.